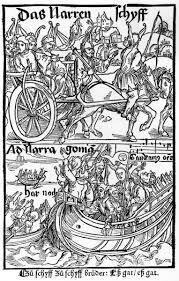 The parade on wheels stems from an old pagan spring ritual. 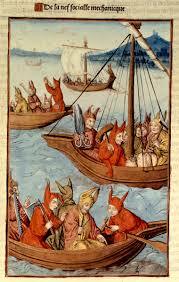 The first historical mention dates from 1133 when a curious ship on wheels wandered in the Low countries. 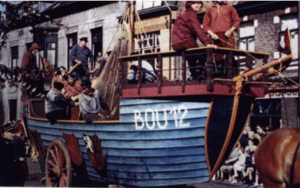 The enthusiast inhabitants of Maastricht presented the crew with sails! 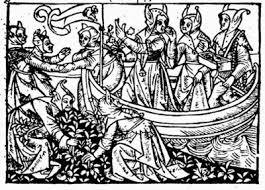 A certain Bishop Rudolfo was so much horrified that he described it in his chronicles as a Diabolicam Technam, a tool of the devil. 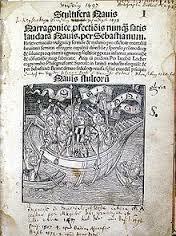 To annihilate this scandalous bunch he invoked the assistance the Duke of Louvain who instead sacked his monastery. 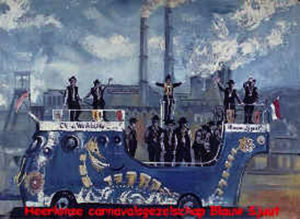 In the archives of many a Dutch city are still kept fifteenth century invoices for the carnival carts, mounted by the brothers of the Blue Barge Guild. 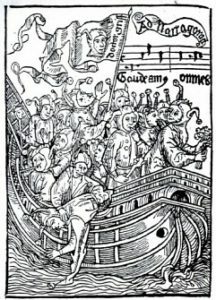 The Dutch language still has a surprising number of synonyms for the Ship of Fools, the most famous being the “Blue Barge” or “Booze Boat” or even, on wheels, the “Wheel Cart” or “Cart Ship”. 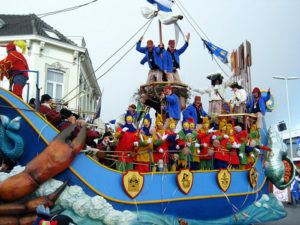 For a long time investigators assumed that the word ‘carnival” was derived from “Carrus Navalis” (The Cart of the Sea), which indicates a close connection between the two. Within carnival Blue Barges still abound! and immediately translated in countless pirate editions in several languages. 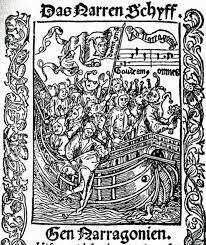 Woodcut by Albrecht Dürer. 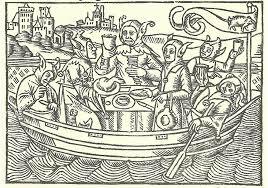 The Ship of Fools is depicted as a ship on wheels..
We’ve fools enough apart from these. Our travelling will never end.